Black Velvet Distilleries Workers Push Back Hard and Win! 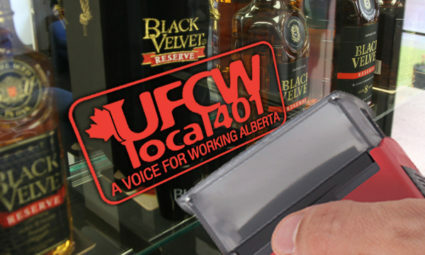 Following a trying set of negotiations, and after sending a strong message to their employer with a 98% strike vote, workers at Lethbridge’s Black Velvet Distilleries secured a new Union Contract (Collective Agreement). Despite the employer’s initial demands to impose significant concessions on their workers, “the strong strike mandate sent a clear message to the company to get to work and negotiate a fair contract,” said lead negotiator Lee Clarke. In an inspiring show of solidarity, the membership, in their resolve, won a number of improvements like pension increases in each year, improved boot allowance, increases to benefits such as eye glass coverage, massage, as well as improved chiropractic care. There were also significant increases to shift premiums, as well as wage increases in each year of the contract, including retroactive pay! The 5-year deal (4 years going forward), achieved through mediation, was voted on by the membership with an 80% acceptance. Congratulations to the members’ negotiating committee as well to the entire membership for your inspiring solidarity and unity. Standing together and voting overwhelmingly for strike action assisted greatly in convincing your employer to make an offer that was more respectful of your contributions to the company’s success!